Welcome to the 3rd annual Halloween episode, Episode 26. This time around we pay tribute to Harry Houdini who left this mortal coil on Halloween back in 1926. In addition to the stupefying feats of conjuring and illusion he was best known for, Houdini spent 30 years exhaustively researching spiritualism and the paranormal. Sitting with and studying the techniques of the best known mediums of the day, and ultimately being unconvinced that the were capable of their grandiose claims. Next we take a look at electro-magnetic fields as they relate to investigating the paranormal. Looking at the reality of what the fields are, and the leap of faith required to draw some of the conclusions that investigators seem to draw from them. Aside from that there is just a whole lot of music. Out of the gate we discuss the bizarre affliction that has come to be known as Morgellons disease. This condition, as yet unrecognized by the medical establishment, includes such symptoms as the growth of multi-colored fibers from the body that have been reported to move autonomously, and strange crystalline or granular residue that appears within lesions all accompanied by the feeling of insects crawling under the skin. The CDC has begun looking into it after several years of requests from those that suffer from it. However in some medical circles it continues to be looked at as a psychological rather than physiological condition. Then there are those that see the condition as a result of something more nefarious. After that we take a look at a set of core components by which hauntings might be judged in order to come up with some type of standardized scientific perspective on what occurs in a haunting scenario. Along the way we touch a bit on Patternology and the Fortean perspective of holistic review rather than compartmentalized observation. Finally, a piece I had to re-record after some breaking news today altered the story dramatically. 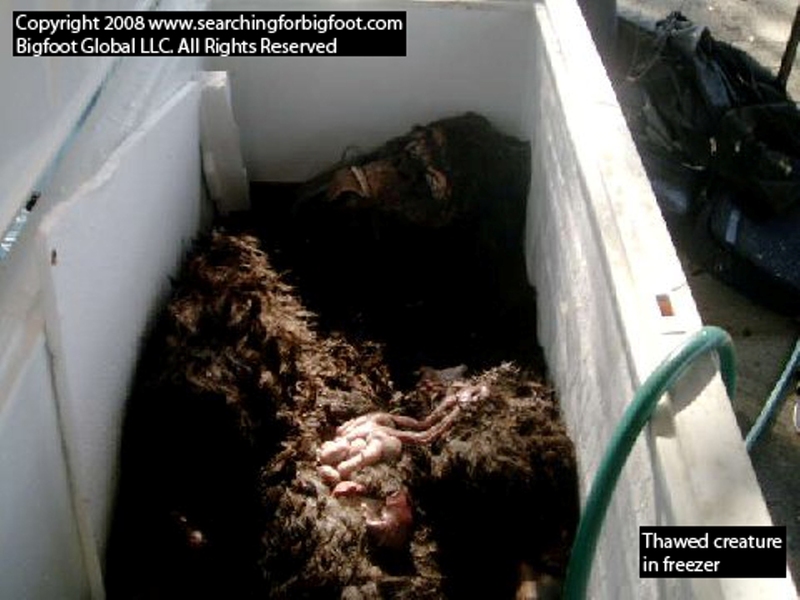 Bigfoottracker.com, now working in cooperation with Searchingforbigfoot.com have announced that they have a Bigfoot corpse in their possession, and will be presenting their collected evidence on August 15th at a press conference in Palo Alto, CA. The creature is said to have been discovered in Northern Georgia, and additionally live creatures were also seen in the area at the time. This has been a twisted tale that first appeared on Cryptomundo.com about a month ago. Since that time several evidence free, taunting videos were posted and removed by the members of Bigfoottracker, and the alleged pathologist they had reviewing the corpse was found to be a fraud. The group admitted to hoaxing the pathologist story, but maintained they did have a body. Today a press release was issued fleshing out that claim, and there has been a leak of a photo. The story was covered by local papers but I didn’t see much else in the way of mainstream coverage, but I suspect that will be changing very soon. The photo is compelling, and I look forward to hearing more details from the press conference. That’s all for now, I will hopefully have some additional information on the Sasquatch story in the coming days. I’m also hoping to clear out some of my back log of stories by updating the site more frequently between episodes of the show. Welcome to episode 18, some of the little improvements I have been hoping to do for awhile finally got taken care of, so hopefully you’ll like those. This time out we look at the legacy of Mary Toft, she was involved in a hoax in 1726 that drew the attention of the King of England and inspired perhaps the most famous of any trick in a magicians repertoire. Her story is outlined further in the book “The Girl Who Gave Birth To Rabbits: A True Medical Mystery,” which I am hoping to check out before too long. Next we take a trip down south to check in on a couple of mysterious creature sightings. One is believed to be a possible Skunk Ape and the other dubbed the Beast of Bolivia, is killing dogs in South Carolina. In addition LiveScience.com ran a recent article on the possibility of using hi resolution satellite imagery to search for elusive breeding colonies of various cryptids. Finally we take a look at the theory of palingenesy, the alchemical idea inspired by the work of Greek philosopher Lucretious that sought to explain ghosts and apparitions chemically, rather than metaphysically. The thought was that a body’s form resided in its salts, and by applying heat to those salts, you could regenerate the form of a dead or destroyed plant or animal as an apparition. This one is pretty interesting and I have been meaning to cover it for a few weeks so I hope you find it curious. Well, this was intended to be the second annual Halloween episode… it is a bit late. Listen to it through pumpkin shaped headphones if you will. Halloween is a time of year and a feeling in the air, not simply a day on the calendar. This episode looks into ghostly sightings and communication with the dead through various gadgetry. Our first stop is among the urban legends and paranormal sightings on a secluded lane known as Zombie Road in western St. Louis County. And looks briefly at investigations by missourighosts.net and the Missouri Paranormal Research Group. Then it is off to 1930’s Britain for a peek at the contraptions of the Askir-Jobson Trianion Guild, who with information they claim to have received from a deceased colleague created devices to facilitate communication with spirits. Another person who more recently claims to have received instructions from entities on building a device to communicate with the dead is Frank Sumption. His creation, quaintly called “Frank’s Box” or “The Ghost Box” uses more modern electronics to create what he believe is a live EVP receiver. You can check out the schematics for the device here, Coast to Coast AM did a show on the subject as well that you can check out here, and I have included a video of the device in action for you to judge for yourself. Finally, we take a look at the theories behind the talking board, or Ouija board, from the Spiritualist and Atomatistic points of view. You can find a mess of Ouija stories and transcriptions here at the Grave Addiction site and I’d recommend checking out the Museum Of Talking Boards for a great photo gallery of various talking boards over the years. Thanks again for having a listen, my apologies for the lateness of the episode. The next one should come much faster, and I have a few stories saved up for the site as well. Beyond that I also give a quick recap of recent articles from the site and offer up some new coverage. A collection of escape artists are seeking to set the world record in a one day relay of over 80 escape performances, while a grizzled old school freak takes the law into his own hands. A pillar of the pharmaceutical industry is working on a virtual reality rig that gives the user a window into the schizophrenics world, and then there is this look at how schizophrenia fits into the evolutionary chain. Another team working on solving our world’s energy issues are looking at cow stomachs as the golden ticket to solve our woes… environmentalist/animal rights advocates heads explode at the conundrum. There are couple of stories from the lab regarding brain surgeries with unexpected results. One involving a skull that passed its expiration date, and another where a young boy is catapulted into the land of posh. Also a look at some research on the Orb Phenomenon from researchers associated with NASA and the Vatican where they find that orbs are indeed of paranormal origin. I think the question remains quite open, but they feel convinced. Welcome to the newly renovated Spookatorium. With episode 15 I have expanded the focus beyond music and pulled open the beaten old trunk of the strange and unusual. Each episode will feature a handful of curious tales and the website will be updated frequently with additional content as I find stories of interest. In addition you will hear the moving tale of the death of a vampire peacock struck down in one of the shadowy corners of New York City, and the citizen who would not let its passing go unnoticed. I have a haunted lighthouse to tell you about, and ladies and gentleman, you can buy it for a dollar! I also take a look at the alleged tales of haunting in a remote Michigan town. A small town in Mississippi sees a strange creature on the loose, and doesn’t jump to cryptoid conclusions! An amphibious giant from beneath the sea with a hostile message is made an example of by the Dutch.